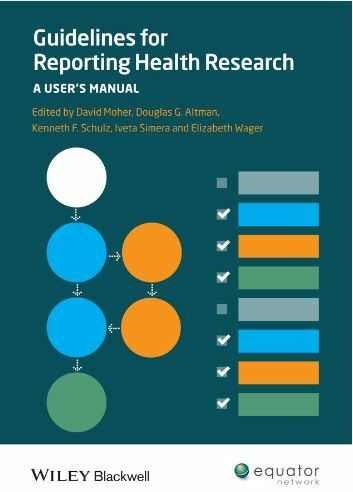 Written by the authors of health research reporting guidelines in association with the EQUATOR Network, Guidelines for Reporting Health Research: A User’s Manual is a practical guide to choosing and correctly applying the appropriate guidelines when reporting health research to ensure clear, transparent, and useful reports. 22 internationally recognised published guidelines, such as CONSORT, STROBE, PRISMA, and STARD, in a clear and easy-to-understand format. We hope that authors, editors, and peer reviewers will find Guidelines for Reporting Health Research to be a valuable resource when writing about and publishing health research. You can purchase the textbook here. I found the book to be well written and chapters could easily be read as stand-alone items if required, due to each chapter dealing with a single guideline or idea… On a personal level, I found the included examples illustrating good and bad reporting versus good and bad conduct, particularly useful. The closing chapters outlining how to report statistical analyses within research manuscripts and tips for the presentation of figures and clinical images in scientific manuscripts were also excellent. Although this book is suitable for all researchers, it will have the most impact on researchers who use a variety of study designs in their investigations… Journal editors, editorial board members, and publishers would all benefit from keeping a copy of this book on hand. Finally, trainees interested in clinical research would benefit from reading this book from cover to cover as it will help them acquire a firm understanding of the best reporting practices for most types of clinical research.